Rapid doors often enable one of the critical pathways into your facility. Therefore, it is essential to ensure that they are appropriate for their intended use, secure and in good working order. If you are having problems with your current rapid doors, then you need to have a professional determine if it can be repaired or if it will need to be replaced. Here are some of the most common factors that will affect the cost of a rapid door repair. In order to be in a position to provide your facilities with onsite support and service to critical doorways, it is often beneficial to conduct your own basic services and inspection. However, it is good practice to schedule routine inspections with a professional, such as an industrial door supplier, as they will have good knowledge of the products, possible related issues and will carry stock of spare parts. An industrial door supplier may also be able to upgrade the equipment for you in time, when/if doors require replacement. A typical service call will include a manual inspection of the door and opener. Then adjustments can be made including limits and force adjustments and door and motor lubrication. Fees for a Rapid Door Service Call could vary from $95.00 +GST for an inspection, up to $300.00 +GST for inspection and service. By comparison, a repair bill when something goes wrong with your door can run to anything from $1,500.00 up to $6,000, depending on the nature of the damage or failures. a) The door will not open or close. Photocell Sensor Obstruction – most automatic doors are equipped with photo electric sensors at the base of the track to provide safety for pedestrians; any obstruction could make your rapid door fail to operate correctly. Check to be sure there is nothing in the path or across the face of the sensors. It is not uncommon for Service Technicians to be called to a malfunctioning door, -only to remove a spider web, -or somebody’s jacket covering the photo-electric sensors! Remote Controls– If your door is connected to Remote controls, it may be worth checking battery and frequency programming. If there is a small light on your remote, press the button and see if the light illuminates. If it does not, likely you will need to replace the battery inside the opener, and/or re-program the remote to the receiver card. This is a very inexpensive repair, and may solve the problem. Track Obstruction – Sometimes accidental damage to the door guides can be enough to cause the door to jam or bind during operation. Examine your tracks for potential damage like dents and kinks. Look at your curtain in the open position to see if it is hanging unevenly. If the track is damaged or the door is hanging unevenly, it may be time to call a professional for repairs. Replacement guides can typically cost up to $470.00 per side, depending on door type and size. Cost for correcting the uneven hanging of rapid doors themselves can vary greatly, and is likely to require removal and realignment of the door head unit. b) The movement of the rapid door is uneven or jerky. Spring Issues - Unless it is due to an obstruction of some type, uneven movement of your door could potentially be caused by a problem with the spring mechanism. Many conventional rapid doors have 2-4 extension springs, holding tension on the door curtain. These springs are under significant tension and are dangerous if handled by untrained mechanics.Therefore, it is necessary to call a professional for any repairs to this type of spring mechanism to avoid serious injury. Replacement of an extension spring or cables in a garage door or rapid door can take at least two or three hours of labor, and may require hire of access equipment such as a scissorlift. Track Issues - If your rapid door tracks are bent or warped in any way, your door will move unevenly or refuse to move at all. Depending on the degree of damage, your tracks will need to be repaired or replaced. Refer to detail above relating to Track Obstruction. 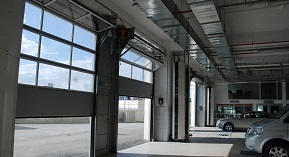 Brake issues – Many automatic doors are electromechanically braked. These components work continuously at high inductive voltage and wear out over time. As they wear, it is not uncommon for relays and brake rectifiers to become faulty causing the brake to engage intermittently, which will show up as jerky door operation. If this occurs it is recommended a Door Technician carry out repairs, which could range from $$210.00 for a minor relay replacement, or up to $600.00 plus access equipment if the mechanical brake requires replacement. c) Your rapid door makes loud noises when opening or closing. Lubrication Issue - Squealing, screeching, or grinding noises from your door may be indicative of a lack of lubricant or an accumulation of dirt or debris in the tracks. When removing debris, do not use harsh chemicals to clean the tracks. Once the track is clean, check with your supplier whether you should coat it with lubricant designed especially for rapid doors, if possible. Never lubricate door components without the instruction of the door manufacturer. Application of poor or incorrect lubricant may lead to further damage. Misalignment Issue –If the door has been impacted, or a roller is damaged or broken, the door may operate with excessive noise and vibration. In this instance, it is recommended that a qualified Technician inspect and repair the door. d) Your rapid door does not hold open, and slides down to closed. Many non-counterbalanced doors may show this malfunction as an indication of brake problems. Motor brakes are not always expensive to repair, but should always be carried out by a qualified Technician. Torn or Broken rapid door curtain: The major cost of this repair is the labour it takes to replace or repair it. Depending on the curtain material, most damage to a rapid door curtain can be repaired. However, best results for these type of repairs are achieved when the door curtain can be removed and repaired in the door manufacturer’s factory, using high frequency welding equipment. Removal of your damaged curtain means the door needs to be out of service for 1-2 days, and costs could run to $1,000 plus access equipment. Sometimes it is worthwhile replacing the entire door curtain at slightly higher cost, to minimise down time for the door’s operation. Impact damage: Depending on where they are and how badly dented it is; dents to the door frame or curtain edge can cause other, bigger, issues with the rolling mechanism of the door. Ask your supplier to come out and assess the damage on site. They may suggest new door frames, or a simple repair but it is worth getting it looked at in case it is affecting another element in your door which could result in an even costlier repair. Damaged Curtain bottom edges: There are many rapid doors on the market with a hard bottom edge which can be dangerous as well as expensive. In Europe, after a few incidents due to the excessive speed of the curtain and the stiffness of the embedded sensor, the European Community implemented new regulations (EN 13241-1). Among the various normative constraints, the requirement against mechanical crushing during closure makes necessary to prevent contact with the door being closed or, in case of contact, to limit the vertical dynamic load below a strict curve. If the high-speed door does not meet one or more of these constraints, the closing speed will be limited to 0.5 m/s (1.64 ft/s). Only a few manufacturers offering a fully flexible and harmless sealing edge kept possibility of closing at a higher speed. 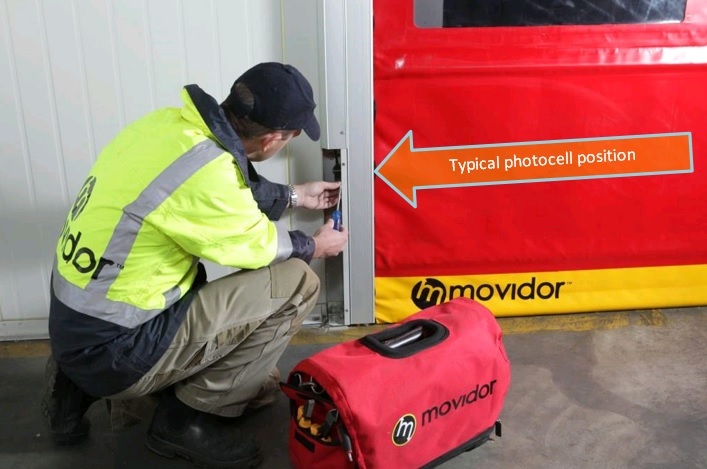 Movidor high speed doorshave been engineered with a yellow soft edge which reduces the repair costs from vehicles and forklifts bumping into the door. Repair costs to replace an impacted bottom edge can run to $2,000. Rapid Roller Doors: High speed doors that are fast, robust and tough enough to handle a range of traffic, irrespective of the environment. They cater for extra large openings, providing speedy access solutions even in wet environments as well as coolrooms and the short opening and closing times reduce cooling loss, avoid airflow and enable a smooth operating procedure. They can also be designed in larger dimensions for the mining and aircraft industries. 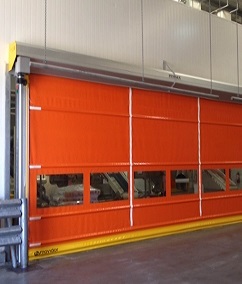 The Movidor high speed roller doors are Faster, Safer and Smarter and designed to operate continuously in warehouses, distribution facilities, coolrooms, manufacturing facilities, car wash facilities and many more: with minimal maintenance due to the self-repair featurewhich reacts to impact and relocates the curtain back into the guides. Rapid Doors are generally made-to-order for exact size and custom features, designed to be able to withstand equipment impact (break-away if accidentally hit by vehicle) and designed to sustain heavy usage with minimal maintenance. Sectional: Also known as a raised panel door, this door is the most common in facilities such as loading docks, car showrooms, (here is a project completed with Mazda) automobile factories, car parking areas such as underground apartments, and residential garages. It is made of several horizontal panels hinged together, fitted with wheels and mounted within a track. The biggest advantage of this door is it takes up relatively little space, watch this video on Compact Sectional Doors, and easily controlled with a standard remote garage door opener for a nominal cost. Their moving parts are readily accessible which can keep repair costs low. The experiences of many warehouse and distribution companies have proven that the Total Cost of Ownership (TCO) for operating and maintaining a high traffic-use door for its workable life is significantly higher than the purchase cost. 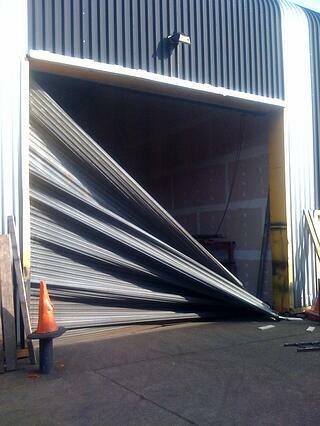 Damage from forklifts and other vehicles dramatically increases the TCO of the door. Where a steel roller shutter may cost $4,000-5000** to have installed, costs to repair or replace bent metal slats, wind-locks etc, can amount to $500-1000 per instance, not including downtime or production loss while the door is inoperable. With some high speed doors, the costs can be significantly higher. Where a conventional high speed door may cost $12,000-$14,000 to install, costs to repair bent bottom bars, replace cables, springs or sensors, can easily amount to $2000-2500 per visit. In some situations, it is not uncommon for companies to spend $5000-$8,000 per annum for maintenance and repair costs for one door alone. This need not be the case with proper evaluation of door design and activation options. 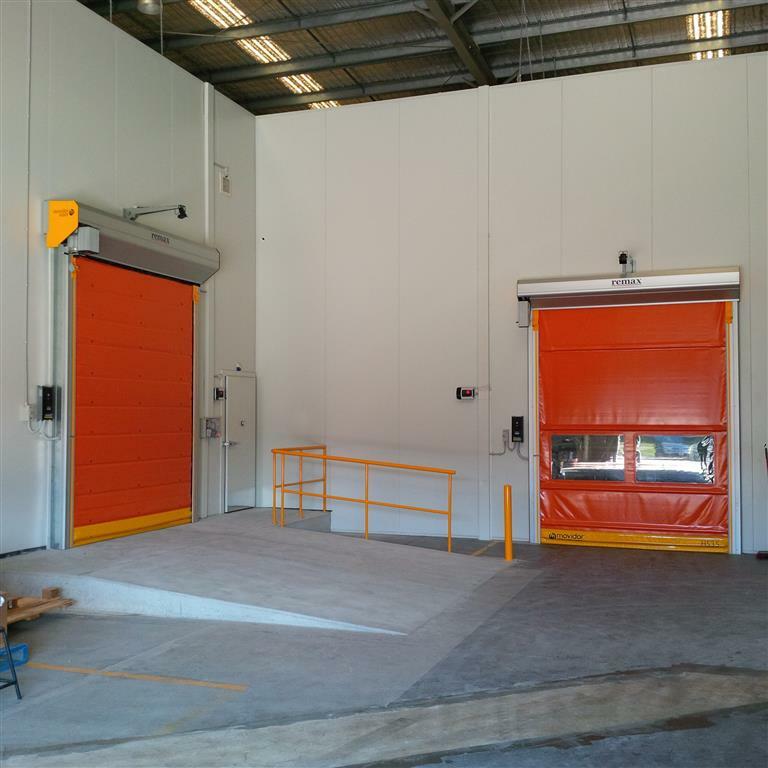 Some high speed door equipment such as the Movidor range by Remax, while costing 10-15% more to install initially, have been designed to accommodate the accidental impact from forklifts, and will operate for millions of cycles, with minimal maintenance required. The Total Cost of Ownership of these doors is significantly lower, which quickly outweighs initial cost considerations. 4. What About Rapid Door Finishes and Accessories? Before choosing a rapid door for your facility, think about the day to day activities that happen in your facility, such as, do you need to regularly wash-down the area? Will your rapid door cope with being cleaned by pressure washers and harsh chemicals? Think about outside conditions and weather proofing against strong winds or drafts. Do you need to include ventilation panels in your door? Will you benefit from a including wicket door within your sectional door so that pedestrians can come and go without opening up the entire door? Do you need natural light in your facility even with the doors closed? Do you have ongoing concerns with service / breakdown costs of your existing Rapid Doors? The Self-Repair feature which can be found on all Movidor Rapid Doors can significantly reduce repair costs and downtime often associated with conventional hard-edge high speed doors. In some cases, the annual spend on repairs and maintenance of problematic conventional high speed doors can be reassigned to new Self-Repairing flexible high speed doors, with a quick payback period. Your rapid door is a major investment and entryway to your facility, therefore it is important to keep them in good working order for your own safety, security, and convenience. Choosing the right style and appropriate materials will reduce the amount of repairs that may arise, and thinking about the location and services offered by your supplier for quick call-outs, knowledge of the product, spare parts and future upgrades or assessments to improve the efficiency. Additionally, investing in regular maintenance can be cost-effective in the long run. If your rapid door is in need of major repair, it is best to call a professional door repair company for assistance. Typically, the company will charge for at least one hour for making a service call. However, the benefits of a professional repair job can well outweigh any costs, as a professional approach can ensure the safety, security, and proper operation of your rapid door.